WDHC is unique as we are the only Club in the UK that hold Mock Hunts. We are very lucky to have the use of the fantastic facilities at Warren Barn Farm, Woldingham and to have connections with other local farmers. Other Meets subsequently confirmed, and updates to those above, will be advised on the website. Please note, you must complete and sign this disclaimer before joining a mock hunt. So what are Mock Hunts? These take part during the Autumn/Winter seasons and are run by our most experienced members passing on their knowledge thus enabling all levels of horse and rider to participate. You must wear correct headwear and be turned out neatly. A black jacket with a white stock and white or beige breeches or, a tweed jacket (known as Ratcatcher) with a shirt and tie, or a coloured stock, and beige breeches, together with riding boots, should be worn. We also have a prize for the best turned out so it well worth the effort of plaiting up and wearing a hair net (where applicable). 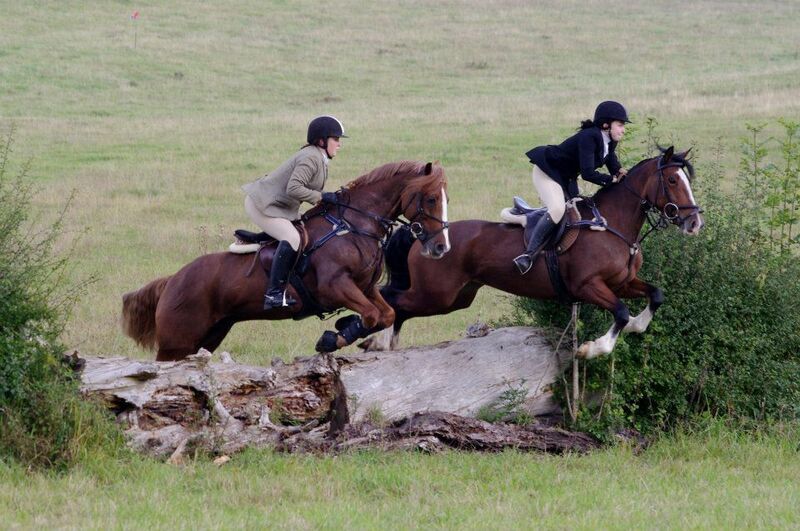 We, also, advise you to wear back protectors, as with many events with horses, but this is not compulsory. We also have a paramedic, who follows us on our beginner mock hunts, just in case. The Hunt Masters wear Red coats as do the Hunt Staff whilst Hunting Farmers wear Black coats, unless acting as a Hunt Master. 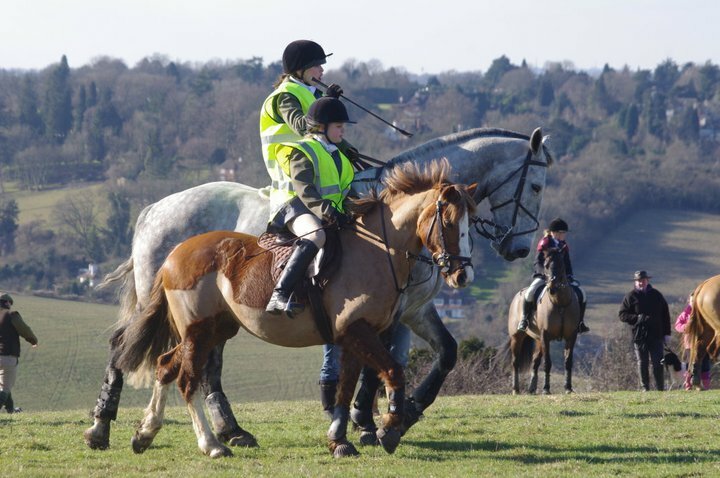 Warren Barn in Woldingham is ideal for beginners as the hunts are run on one large farm so easy to get back to the lorry park if you retire early i.e. throw a shoe, toilet break, horse/rider not fit enough etc. The postcode for Warren Barn Farm is CR3 7HN for those with a Satnav. We have toilet facilities at Warren Barn but no refreshments so remember to bring your own (a hip flask comes in handy). Although you will always get the opportunity to have some mulled wine to warm you up before the off. It is important to ensure you are adequately dressed for the weather winter hunting can be really cold especially at the top of the Downs so wear plenty of layers and bring a hot drink for afterwards. If you come by horse box or trailer, please ensure you park you vehicle considerately and on no account block a local resident’s drive. At Warren Barn Farm, there are ample parking facilities. Before the Hunt commences, you will receive a welcome message from the Hunt Master and it is important to listen to instructions and advice given at all times. If you have any questions, please ask. Always make way for the Master, hunt staff and hounds at all times. Behaviour in the field goes without saying but you must obey the instructions of the Master, or his deputy, at all times. If your horse becomes excited and find yourself in front of the Master, turn away as soon as possible and rejoin the field further back. At all times allow sufficient space between you and the horse in front. 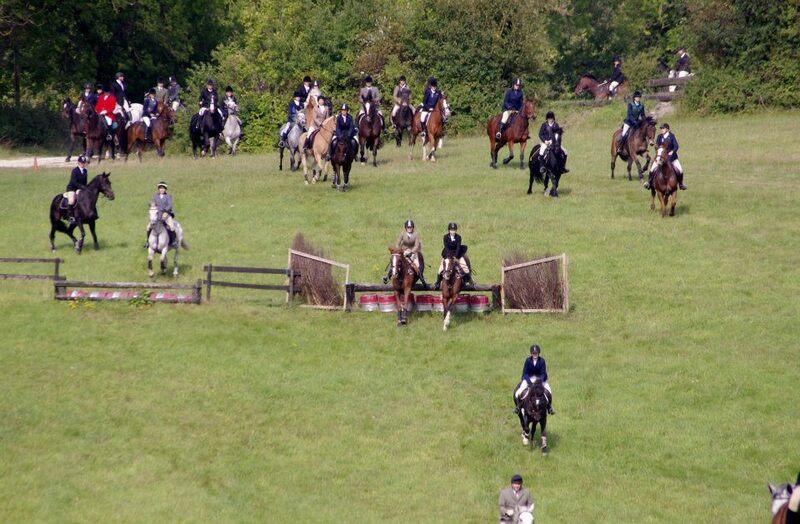 Queue in an orderly fashion at set jumps and if your horse refuses, make way for others before trying again. There will always be somebody willing to give you a lead if required. Generally, we meet at 10.30am for 11.00 but check the website or phone if in doubt i.e. due to weather conditions. The weather or ground has to be seriously bad before a hunt is cancelled so don’t worry. If you haven’t been before, don’t be concerned, just let one of the Masters know and they will keep an eye on you or you can stay with them for support. The cap is £15 for members and £25 for visitors. Payment is called a cap and is taken on the day so no advance payment is needed, just turn up. As regards membership of the Club, this brings many benefits-see website. In respect of the hunts, the cap for members is, as mentioned, £10. less than visitors so the annual fee is quickly recouped. 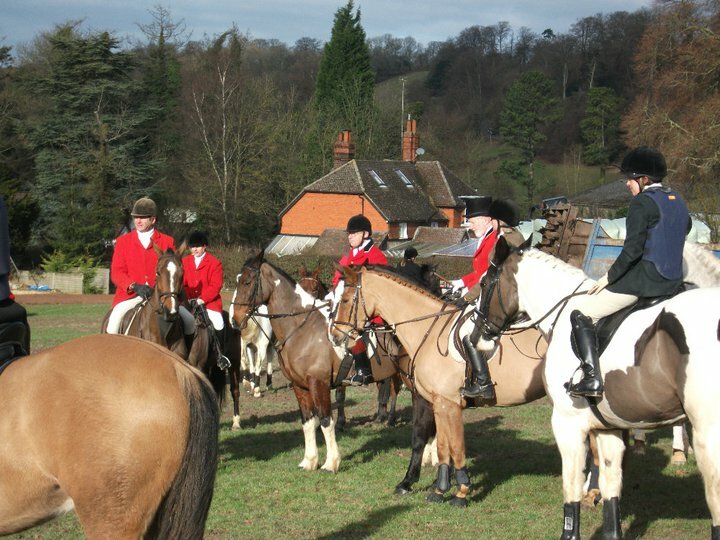 In addition, new members of Warlingham are invited to hunt twice with the Old Surrey Burstow & West Kent for only £25. per day compared with their usual visitor’s cap of £90. for weekdays and £120. for a Saturday. A big saving which covers our membership fee a few times over. Important: If you are a novice or riding a novice horse you should wear a green ribbon if your horse is likely to kick wear a red ribbon. All our jumps are optional at Warren Barn with a few on other hunts that may not be although they will not normally be any bigger than about 3ft. Foot followers can also come along and we can point them in the direction of the best places to stand although they may want to bring some binoculars. Finally, we aim for you to have a great day out with us. Donations are always gratefully received!